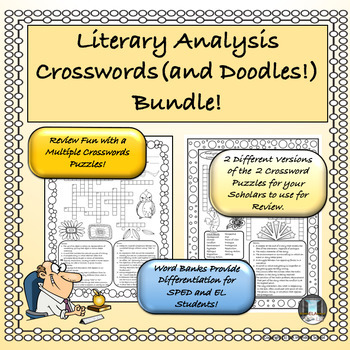 Literary Analysis Crosswords (with Doodles!) Bundle! Analyzing Fiction Crosswords (with Doodles!)! Figurative Language Crosswords (and Doodles!)! Students love learning when learning is fun! These Crosswords Puzzle allows students to review their knowledge of key vocabulary while enjoying the challenge of completing an individual puzzle. The imbedded sketch art from Granny Goes to School, Ron Leishman Digital Toonage, Creative Lab, and Dancing Crayon Designs allow students to further express themselves by coloring the drawings or making use of the doodle borders! The student will review key vocabulary words. Teacher Prep Time: Just print and go! Please see individual puzzles for terms to be reviewed. This lesson is appropriate for grades 6-8. Note: ELA in Middle School utilizes artwork from Granny Goes to School, Ron Leishman Digital Toonage, Creative Lab, and Dancing Crayon Designs in our products. Get TPT credit to use on your Future Purchases! Go to your “My Purchases” page and click on “Provide Feedback” button. Your feedback is greatly appreciated! Click here for more information. Grammar Review with Color by Numbers Nouns and Verbs! A Bundle of Grammar Fun with Crosswords (and Doodles!)! LICENSING TERMS: By purchasing this product, you own a license for one teacher only for personal use in your classroom. Licenses are non-transferable, meaning they cannot be passed from one teacher to another. No part of this resource is to be shared with colleagues or used by an entire grade level, school, or district without purchasing the proper number of licenses. I you are a coach, principal or district interested in transferable licenses to accommodate yearly staff changes, please contact TpT for Schools at Schools@TeachersPayTeachers.com or find more information under “Schools” on the Teachers Pay Teachers site. COPYRIGHT TERMS: ©ELA in Middle School. Please note – all material included in this resource belongs to ELA in Middle School. By purchasing, you have a license to use the material, but you do not own the material. This resource, or any portion of this resource, may not be uploaded to the internet in any form, including classroom/personal websites or network drives, unless the site is password protected and can only be accessed by students—no other teachers or anyone else on the internet.